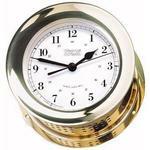 This nautical style porthole desk clock is inset in solid American hardwood that has a mahogany finish and a scratch resistant sole. 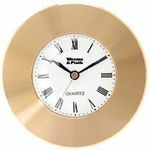 The polished brass finish of the quartz clock will never tarnish. It is perfect for the home or office and has a lifetime manufacturer warranty. An engraveable brass plate for personalization is included. 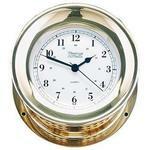 This nautical desk clock looks great from all angles. It is perfect for the home or office. AA battery and instructions included. 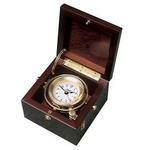 This Porthole Desk Clock comes with a Limited lifetime warranty.